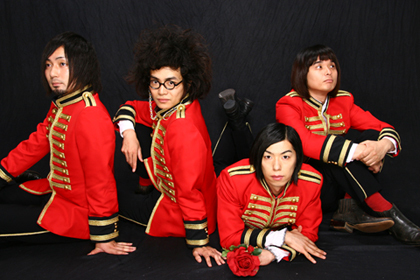 THE CAPTAINS is an active Japanese Group Sounds rock band formed in 2001 in Sendai City, Miyagi Prefecture with the members of Kizuhiko (Vo/G), Hizashi (G), Alexander Ted (B) and Yosuke (Dr). They made their major debut in 2005 with a single “Shisshin Tengoku ~Koi wo Shiyouyo~.” They have been highly praised of not only their unique appearance and characters, but also for the quality of their performance. In 2007, they went on a US tour which was indeed successful. They are continuing on with their powerful live performances all around Japan.